WASHINGTON (AP) — More Republicans are urging President Donald Trump to halt his attacks on the late Sen. John McCain. But Trump is continuing to complain about the Arizona senator’s health-care vote seven months after McCain died of brain cancer. “I’m not a fan of John McCain,” Trump said again Thursday in an interview taped for Fox Business Network’s Mornings With Maria. "I do not appreciate his tweets. 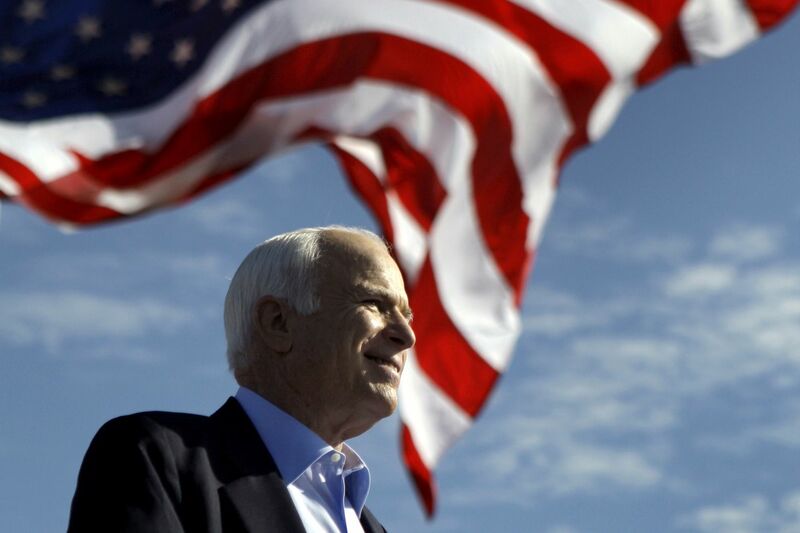 John McCain was a dear friend of mine," Sen. Joni Ernst of Iowa, a member of the Republican leadership and a veteran, said at a town-hall meeting Thursday, according to video posted by the Des Moines Register. "No, I don't agree with President Trump. And he does need to stop that." Trump has stuck to his suggestion that McCain, a prisoner of war in Vietnam, was not a hero because he was captured. And the president can’t seem to get over McCain’s decisive thumbs-down that sank the GOP effort to repeal President Barack Obama’s health-care law. There wasn't much reaction from the crowd to Trump's references to McCain's funeral. The president wrapped up the remarks after five minutes with an acknowledgment that his opinion of the late senator isn't shared by all Republicans. "Some people like him, and I think that's great." In fact, McCain’s family made clear that Trump was not welcome during the weeklong, cross-country ceremonies that the senator had planned himself. Instead, McCain invited former Presidents George W. Bush, who defeated McCain during the 2000 GOP nomination fight, and Barack Obama, who defeated him in 2008, to deliver eulogies on the value of pursuing goals greater than oneself. Trump signed off on the military transport of McCain’s body, went golfing, and was uncharacteristically quiet on Twitter during the Washington events. After the health-care vote in 2017, Trump was furious, and it showed in the days after McCain’s Aug. 25 death. The administration lowered the American flag over the White House to half-staff when McCain died on a Saturday, but then raised it by Monday. After public outcry, the White House flags were again lowered. The Kentucky Republican, who is up for reelection next year, never mentioned Trump, but others weren’t so shy. Associated Press writers Lisa Mascaro, Catherine Lucey, and Bill Barrow contributed to this article.